Another patient has reported a successful conception. Great news! Now what? After a course of treatments to assist with conception, we generally recommend weekly acupuncture to decrease or eliminate some of the not so pleasant effects of pregnancy during the first trimester. A common complaint is the familiar feeling of nausea and even vomiting during weeks 6-12 of pregnancy. We makes specific recommendations for dietary therapy along with acupuncture to help our patients enjoy this often long awaited joyful time. 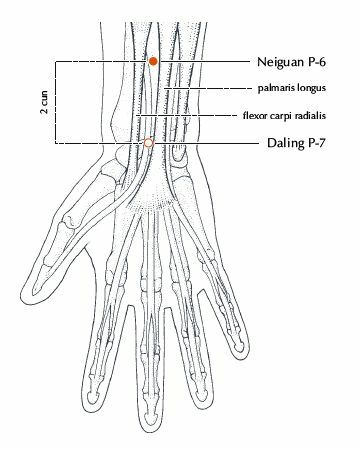 We also teach acupressure points for use at home, such as Pericardium 6. Pericardium 6 is a point located on the inside of the wrist useful for many different stomach issues including morning sickness, hiccups, motion sickness, food poisoning or stomach bugs. We also use this point frequently at our work at the National Life Cancer Treatment Center at Central Vermont Medical Center for side effects of chemotherapy. This point has been studied in many scientific publications, including this from PubMed. You can easily access this point yourself when feeling nausea. From the inside of your wrist go 2 fingers width up the midline, about 2 inches. If you make a fist, you may be able to even see an indentation between your tendons right in the middle of your arm. That’s the point! Apply firm pressure for at least 2 minutes when you feel nausea and you you should be feeling better soon. For regular prevention of stomach issues, come in for a visit where we can adjust your diet and recommend herbs for your specific issue.